If your straw thickness and vessel size vary, just make sure the straws are packed tightly into the vessel with little space around them inside. This will ensure you make the maximum number of worms from the mixture, with minimum waste. Omit the cream for a dairy free version if preferred. Soak the gelatine leaves in a wide dish or bowl in just enough water to cover them for 5 to 10 minutes, until soft. Put the blackberries and water in a medium pan set on a gentle heat. Simmer for 5 minutes, crushing the berries occasionally, until they have softened. Pour into a fine mesh sieve set over a jug and push through as much as possible with the back of a spoon, leaving the seeds behind. Squeeze the excess water from the softened gelatine. Add the gelatine, honey and cream to the blackberry liquid, stirring until dissolved. Leave to cool slightly. Cut the straws in half, bunch them together and tie an elastic band or masking tape near the top of the bunch to keep them tightly together. Once cooled, slowly pour the jelly mixture into the tops of the straws. The mixture will naturally settle itself evenly into the straws, so there’s no need to worry about filling each one individually. You will possibly see some of the mixture on the outside of the straws, but as long as the space around them is minimal, don’t worry too much. Cover with cling film and chill for at least 4 hours, until set. Line a large tray with parchment paper. Gently pull the bunch of straws from the jar. Remove the elastic band or tape. Taking one straw at a time, briefly dip it into a jug of quite hot water, then gently squeeze two fingers down the length of the straw to slowly squeeze the worm out. Repeat with the remaining worms, arranging them on the tray as you go. To serve, finely chop the cacao nibs in a mini blender, if using. Pour into a wide bowl or on a plate. 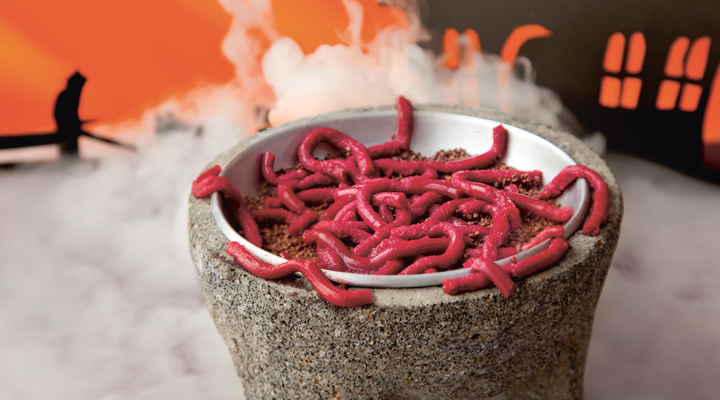 Arrange the worms in a pile on top and serve the jelly worms to unsuspecting guests! These can be made up to three days in advance if you keep them covered on the parchment-lined tray in the fridge.